I reached a milestone ... 20 pounds! It was all very exciting yesterday morning when I relayed the news to my Jenny Craig weight counselor. And then I did what any normal girl would do ... I treated myself to a non-Jenny chocolate chip cookie at lunch. 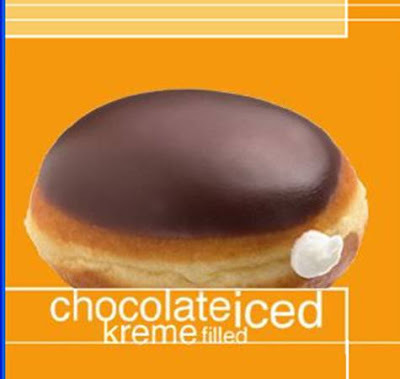 ... Krispy Kreme's chocolate iced kreme-filled glazed doughnut. THE PINNACLE OF DOUGHNUTS. And, not surprisingly, MY VERY FAVORITE. 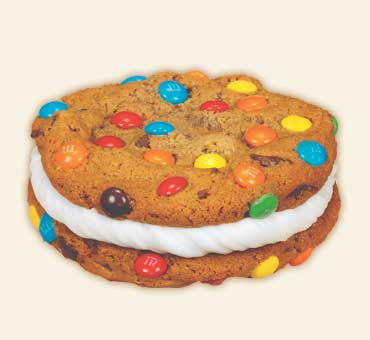 And while I was only 20 feet away from the M&M Double-Doozie, I reined myself in and got a plain old chocolate chip cookie from a deli next door. Meh. It definitely WASN'T double-doozie caliber, but it was OK.
Congrats on 20 pounds! I am so excited to be closing in on my first 10 lost. Congratulations. I am at 10 of my first 30 lb goal. I have a very long road ahead, so I am breaking it down in 30 lbs to each goal. I'm excited about reaching my halfway point AND I'm excited for you girls who are doing so well with your OWN weigh loss! Congratulations to you, too! Good on you! I ABSOLUTELY know the sacrifices and willpower involved in sticking to a weight reduction eating plan when you are cooking for a family who are still entitled to all the yummy things...I'm about to embark on diet number 652 which is pathetic I know - I've been waiting for your update - been interesting seeing how you fare. Well Done again. Congrats on this accomplishment! That is awesome!